He’s one of the most-read authors in newspapers around the country, but he doesn’t write news. Scott Adams, the creator of the Dilbert comic strip is no longer just a busy cartoonist. For years he has been a busy public speaker and author, still boasting of his 12 hour workdays. He is also now CEO of Scott Adams Foods, which is launching a new food product soon to be available on campus called Dilberitos, a vegan burrito. The Tech recently had the opportunity to interview Adams about his comic strip and recent activities. The Tech: Do the characters in your strip bear resemblance to any particular characters in your life? Adams: Yeah, some of them some are composites of people, others are direct. Dilbert’s body is based on the body of one person who doesn’t know it. Alice is based on a woman I once worked with who made grown men cry in meetings. Wally is based on a guy behind my cubicle. There’s a little of me in all of them, like Dogbert. The Tech: Do Dogbert and the other non-humans reflect your views on animals? Adams: Well, Catbert does. I’m a cat owner and as the head of Human Resources, a cat doesn’t care if you live or die. That was a good blend of career and animal. The Tech: If Dilbert married any female cartoon character, what would it be? Adams: I think Broom Hilda is about as good as he could get. But he’d be holding out for Blondie. Ah, Blondie. The best female comic strip character ever made. At least the most well-proportioned. The Tech: Speaking of which, some women in the department want to know why Dilbert’s tie sticks up. Adams: The women always want to know that. He’s either glad to see you or an ironing mishap. Your call. The Tech: Often times you have a series of strips that break from the pace of the usual ones. Have you ever thought about doing a spin-off strip, or an entirely different one? Adams: I actually am working on a spinoff strip set in Elbonia. Its about a little Elbonian boy who is the only one in the country who doesn’t have any hair on his body. It’s called The Hairless Elbonian. But right now it’s only on my Web site site if you subscribe to my newsletter. The Tech: So where do you think it might go in the future? Adams: It was only a project I was doing with my readers and I just wanted to see where it went. But I’m doing a book right now so it’s just on hold. The Tech: What did you feel the readers’ response was to the TV show on UPN? Adams: It depends. I felt the first few shows of “Dilbert” were [the same as] the first few shows that you grew to love like “The Simpsons” and “Seinfeld.” They all really sucked. They didn’t even deserve to be aired. But once their writers got into a groove the series began to improve dramatically. I think we had the same thing going. We became rather successful during the second season, but we moved nights and people really just weren’t interested in finding the show anymore. The Tech: What are you up to these days? Adams: I currently own a restaurant and am building a second one right now. It is called Stacui’s Cafe. And then I’m promoting the Dilberitos. Finally there’s the book I’m writing. God’s Debris is the first non-Dilbert book I’ve done. It’s not a regular book; it’s a thought experiment as I like to call it. Since I’m a trained hypnotist, I tried to write a book to screw with peoples’ heads. What I’ve gathered from test audiences is that it will either freak you out or make you very angry at me, which is a good sign. It’s part science and part religion. None of it is right, it’s just for you to figure out what’s wrong. The Tech: Does being a popular cartoonist noticeably increase your chances with women? Adams: Not according to my girlfriend. I’m in a long term relationship, so I can’t say that I enjoy the cartoonist groupies if such things exist. The Tech: Are there any strips you look to for inspiration? Adams: Not inspiration, really. Nothing is really similar enough to the strip. When I was younger, I was inspired by strips like Doonesbury, Mad Magazine, and Peanuts. It’s pretty good not to look at other comics when you write them. If you really like a joke, it could be the idea you have that afternoon may have come from the morning paper. The Tech: So are there any strips that you admire? Adams: Yeah. Most of the ones I like are new or recent. I’m a fan of Pearls Before Swine, Get Fuzzy, and Randolph Itch 2 a.m. The Tech: When you sit down to write, do you feel like you are being funny or like you are being a vengeful cynic? Adams: A little of both. Honestly, there’s nothing better than being angry for a strip. I’ve always said that as a cartoonist, there will never be a completely bad day because the guy that screws you over the night before becomes your fodder for the next morning. All in all that’s a wonderful feeling. 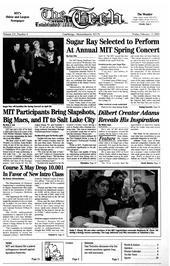 The Tech: Estimate the percentage of this year’s MIT graduates that you think will go on to be dissatisfied work-is-life engineers. Adams: I’d say half of the percentage that become engineers. See, half is one of those fractions that doesn’t scare anybody. They always think they’re going to be in the other half so they don’t fear whatever it is. That’s why people still get married today.